With Saturday’s loss to Columbus Crew, the Philadelphia Union officially were knocked out of playoff contention. The loss also meant that the team has now suffered more defeats in 2012 under John Hackworth (6–8–4) then under Peter Nowak (2–7–2). The loss had an uncharacteristically large number of goals allowed for a Union road game in 2012, and was also the first time this season the team scored more than 1 goal on the road. Despite having a 2–8–4 road record, the Union is tied with San Jose and Real Salt Lake for second fewest road goals allowed with 19, an average of 1.35 goals allowed. (Kansas City has allowed the fewest goals on the road at 14, which only underscores how big the Union’s 4–0 win over them at PPL Park was.) Unfortunately, generally stout defending has been accompanied by a limp offense: the Union are tied with Vancouver for the second fewest goals scored on the road with 10, an average of .71. goals scored per road game (Portland is bottom with 9). Overall, the Union and Chicago are tied at fourth for fewest goals allowed (36) and with Vancouver for the second fewest goals scored overall (31). Of Zac MacMath’s 7 shutouts, 2 have come on the road, 1 for a win, the other a scoreless draw. 3 of the Union’s road losses were 1-0 defeats and 5 of the losses have been by 1 goal. Only 3 times have they been beaten by more than 1 goal on the road. (At home they’ve been defeated by more than 1 goal once in 2012, by Wednesday night’s opponent, Chicago). In addition to the scoreless draw against New England, the Union had 2 1-1 draws on the road. With a little more scoring prowess, how many of those road draws could have been wins, how many of those 1-goal road losses could have been draws or wins? When are the goals let in? Saturday’s loss to Columbus highlighted a increasingly distressing tendency on the part of the Union: letting in late goals, be they at end of the half or the end of the game. As mentioned above, the Union have let in 36 goals over 29 games. 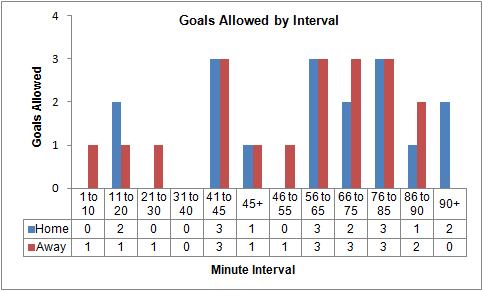 Of those goals allowed, 8 have come in the closing minutes of the first half or in first half stoppage time, 5 in the closing minutes of the second half or second half stoppage time. In other words, 44.8 percent of the goals allowed by the Union in 2012 have coming in the closing minutes of a half. 11 goals—30.6 percent—have come in the final 15 minutes of a game. The Union’s record in those games is 1–9–0. Whether it be from a failure of on-field communication and leadership, late season fatigue, yet another example of the inexperience and mental lapses that go with being the youngest team in the league, or some combination of these and other factors, other teams have no doubt noticed this weakness. By contrast, the Union have scored 4 goals in the closing minutes of the first half or in first half stoppage time, 6 in the closing minutes of the second half or second half stoppage time (32 percent). They have scored 10 in the final 15 minutes of a game for a 5–2–1 record. The 5 goals the Union scored over the past 2 games exceeded the total scored in the previous eight games, going all the way back to Aug. 4. The team’s scoring woes have been a concern, with rare exception, throughout the whole of the 2012 season. As we can see in the chart above, the Union averaged less than 1 goal per game under Peter Nowak. While the goal average has improved under Hackworth, it remains just over 1 goal per game looking at the season overall. In 2010, the Union were tenth in the then 16-team league in goals and in a 3-way tie for 6th in assists. While they were 14th in shots taken, they were 3rd in shots on goal. In 2011, the Union were in a 3-way tie for 8th in goals and tied with 3 other teams in 10th place for assists. They were 5th from bottom in shots, and had dropped to next to last in shots on goal. This year, they are last in assists, shots, and shots on goal and tied with Vancouver at next to last in goals. In 2010, 9 Union players scored, led by Sebastien Le Toux with 14 goals. In 2011, 16 Union players found the back of the net, led again by Le Toux, this time with 11 goals. 12 Union players have scored so far in 2012, led by Jack McInerney, Freddy Adu, Gabriel Gomez, and the now departed Lionard Pajoy with 5 goals each. 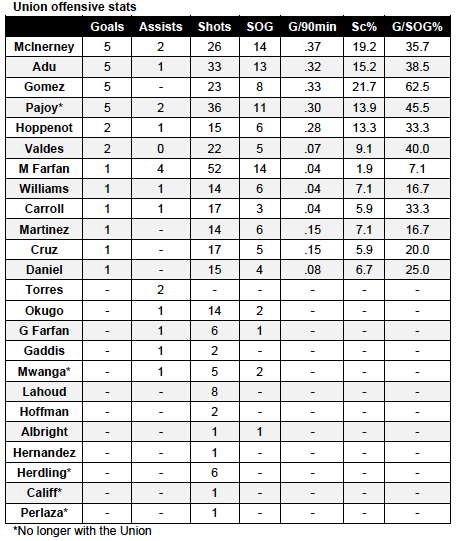 I like how Torres is tied for second in assists with some of the fewest minutes on the team. I can’t wrap my head around the fact that they have fewer than half the assists they had last year. I know there are at least 7 goals from penalty kicks and free kicks but still, what’s up with that? Agreed. Also, his movement off the ball was always intelligent and opened up the field for others.